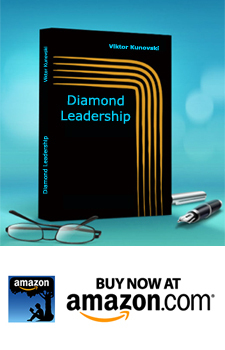 excerpt from the book “Diamond Leadership“. The most important thing that will move humanity forward, is to break down the boundaries between people and to function as a single intelligence (David Bohm). If you take a large group of ordinary people from different backgrounds, and you ask them to make decisions that have a common interest, the decisions of the group will be superior in comparison to the decisions of the individual leader or expert, nomatter how smart s/he is or how much experience or wisdom s/he has. Contrary to the collective intelligence is when managers and politicians ignore the fact that the system is wiser than the individual, and bring in unilateral decisions, solutions and plans, without engaging employees and/or the ordinary citizens in the processes of thinking and decision-making. In such conditions, it is no surprise when the strategies brought in at the top are not implemented as designed. The new post conventional leaders need to become systemic thinkers and doers. In a positive sense, they need to understand and to accept the limitations of their personal intelligence, in comparison with the collective intelligence. The systemic leader needs to become an ally of the collective intelligence. S/he or they (the executive team) need to serve the system by developing co-creative platforms and interventions through which the collective intelligence, wisdom and innovation will emerge, and be distilled through the co-creative process by the system itself. ‹ NOT KNOWING – The power of “holding” a question?